So blog posts have been few and far between as I prepare for teaching. Classes begin in a week and the expected panic is beginning to set in. Last night there was the orientation for new faculty. Over dinner, a couple of adjuncts spoke about the Adjunct Council, a newly formed group that advocates on the behalf of and provides support for adjuncts. During the informal Q and A session, the topic of plagiarism came up and that there should be some statement in our syllabus addressing the matter. Someone asked if the college had a formal statement that we could use. One of the moderators replied something to the effect of "No, I just used a statement that I copied from somewhere else". Thank goodness I didn't have any food or drink in my mouth as I just lost it, bursting out in laughter and saying in a tone just loud enough for the people at my table to hear: "That's plagiarism!". They all started laughing, breaking the rather somber mood and drawing the attention of the entire room. I then felt obligated to repeat my remark out loud so that everyone could hear it. The speaker blushed as red as an apple. I tried adding "...as long as you don't provide attribution" but I think that was lost in the noise. Sheesh, classes haven't even started and I'm already causing trouble. The State of California is suffering through a 5-year drought with no end in sight. Ironically, as much as Californians love to rage against plastics (instituting endless bag bans and regulating countless other chemicals that are added to plastics or used in their production), there are more and more examples of plastics being used to help the state in this time of need. 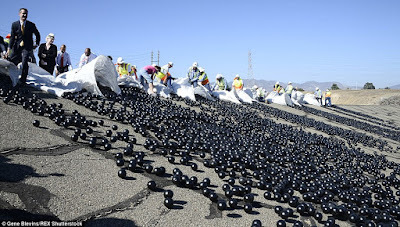 In just the past few days, the city of Los Angeles placed 96 million black, hollow polyethylene balls in a water reservoir. The balls float on top of the water reducing evaporation, keep away birds and provide other benefits. That would have been fun to help install. 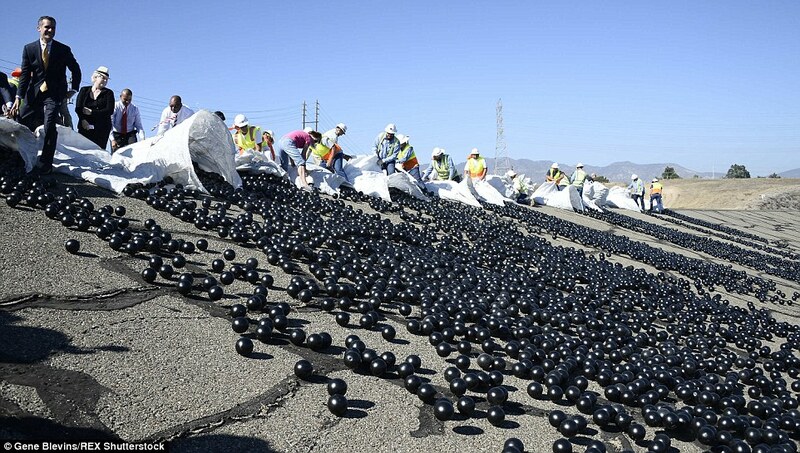 And if the reservoir ever runs dry, then LA will have the worlds largest ball pit. At the same time two, plastic pipe manufacturers are using the drought to help sell their products. Nationwide, about 16% of all purified water is lost due to leaks and broken pipes with most of the pipes being ductile iron. Large volume plastic pipes were not available when most of these water systems were originally installed but they are available now. PVC pipe is ridiculously easy to join. As many homeowners know, you brush on the primer and adhesive and then push the two pieces together. Voila - a solvent weld that is most likely stronger than the original pipe. Doing this with a 12" OD pipe or larger is a little more difficult due to the weight of the pieces, but the heavy equipment needed to lift them is readily available. HDPE pipes are also available. HDPE cannot be solvent welded however, so more specialized equipment is needed to heat up the end sections to allow them to adhere, but again, this is being done more and more in new installations. The unfortunate part of this is that California is 5 years into the drought and only now are these steps being taken. Neither step will eliminate the drought, but they will allow existing water supplies to last longer. Had these steps been taken 4 years ago, the Hollywood movies stars might still be able to water their lawns. It's just another reminder of our inability to focus on long-term problems until they reach a crisis state. August 14, 2014 - Oh Brave New World! Summer is winding down here in the Northern Hemisphere and that means that it's back to school time. For the first time in 26 years I will be part of that. There will be the usual excitement of meeting new students/professors /staff, finding my way around a campus that I am unfamiliar with, new books and supplies and making sure I am in the right classroom at the right time. That last item is easily the most important, as if I'm not in the right room at the right time, there will be no class. This year, I'm returning to the classroom not to sit in one of the seats, but to stand at the front and speak - I'm taking at position as an adjunct professor at Augsburg College. You may not have heard of this school, but you should have. Peter Agre, winner of the 2003 Nobel Prize in Chemistry received his B.A. in Chemistry there. Knowing that, I'm going to be constantly wondering if I am looking at a future Nobelist as well. As you can imagine, the next few weeks will be pretty busy getting ready to this new adventure, so posts may not be as numerous or as lengthy, but they will continue. And once the school year starts, I'm sure that I will have plenty more material to blog about. I can't imagine that the students won't be an endless font of new ideas and items to discuss.